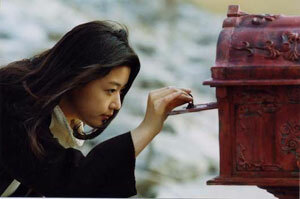 (left) Jeon Ji-Hyun and (right) Lee Jung-Jae check the same mailbox in Il Mare. The Skinny: A man and a woman become the strangest of pen pals in this time-bending, bittersweet romance. Likeable actors, breathtaking seaside imagery, and an inventive storyline more make up for its slow-pace and underwritten characters. But just barely. If "Love Across Time" could be considered a genre, then Il Mare is perhaps its most famous example. Lee Hyun-Seong's 2000 romance boasts an innovative plot involving two star-crossed, would-be lovers who are separated not by any conventional means (race, class, etc), but by something decidedly extraordinary: they both exist in different time periods. Bummer, huh? Early in the film, we are introduced to Eun-Joo (Jeon Ji-Hyun), who until recently had been living in a house dubbed "Il Mare." On the way out, she places a card in the mailbox so the next occupant will forward her mail to her new address. The card is delivered to Sung-Hyun (Lee Jung-Jae), but he's more than a little confused by her request. For one thing, he's the first resident of "Il Mare," and secondly, the card bears a date that's two years in the future! After some feverish written communication between the two, Eun-Joo and Sung-Hyun eventually come to believe the remarkable truth: Sung-Hyun is living in the year 1997, while Eun-Joo lives in the year 1999. Ah, the wonders of a magic mailbox. Rather than abuse this magical gift by betting on the 1998 Super Bowl, Eun-Joo and Sung-Hyun get a little creative. Whether it's retrieving a lost item in 1997 or purchasing something that won't be released until 1999, the two of them make much use of the magic mailbox, even going so far as to have "dates" in the same location at different times - albeit with a few surprises here and there. Eventually, it dawns on them that they should meet in person, setting a date in Eun-Joo's "present day." Unfortunately, although Eun-Joo waits for him, Sung-Hyun never shows. Couple this bad omen with Eun-Joo's rekindled feelings for her ex-boyfriend, and you've got a recipe for a time-displaced tragedy. Even worse, Eun-Joo selfishly (and nonsensically) asks Sung-Hyun to intervene and stop her boyfriend from leaving her in the past. Sung-Hyun, as one might expect, is crestfallen. Will he sacrifice his own feelings to help the woman he loves? And if he wanted to, would he be able to change the past in time? The answer to both questions is patently obvious by story's end - even if the finale itself isn't so clear-cut. It's difficult to talk about the film in any evaluative way without spoiling the ending, but I'll do my best not to ruin the experience for any interested parties who haven't seen the film. Still, if you're in that group, you should probably approach the next paragraphs with extreme caution. POTENTIAL SPOILERS AHOY! Without giving too much away, it's safe to say that the two leads may exist in the same timeline or the magic mailbox has the ability to traverse two distinct, but near identical ones. As such, the film's ending shows either a rupture into (or return to) two separate timelines or a kind of "painting over" of one vision of the future with another. Whatever the case, all this messing with the time stream makes for compelling viewing. What's perhaps most interesting is that the crucial, shall we say, negative event in the film is not brought on by a totally impersonal "cruel fate," but by Eun-Joo's selfish motives. In that sense, the film carries with it the weight of personal responsibility, a veritable dagger to the heart of not only our heroine, but to those of audience members who might not be expecting that extra, much-more heartbreaking dimension. The film wraps up with a more teary-eyed Korean-style conclusion, which will disappoint those looking for a more Hollywood happy ending - a la the American remake, which, say what you will about the film's quality as a whole, has a vibrancy that Il Mare sorely lacks. That's not to say it's all gloom and doom in the clichéd Korean drama mold - it's more bittersweet than anything else. Certainly, a thoroughly depressing ending might've been more daring (and wouldn't have violated so many laws of the time-space continuum), but the filmmakers' decision to split the difference on Il Mare is an intriguing choice in and of itself. END POSSIBLE SPOILERS.